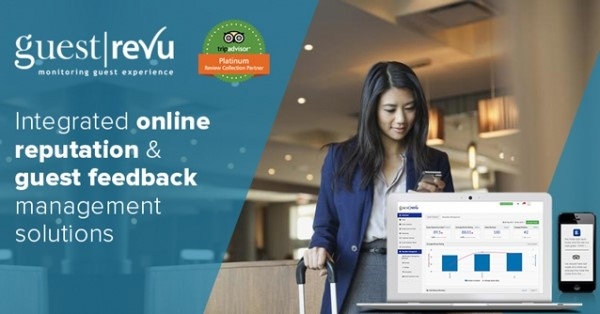 Guestline’s collaboration with GuestRevu provides the industry with automated guest feedback and online reputation management, directly connected to the PMS. 93% of travellers say online reviews have an impact on their booking decisions, which makes this a particularly attractive proposition for hotels, serviced apartments, pubs and hostels looking to further improve their guest pre- and post-stay experience. The GuestRevu tool enables hoteliers to generate a higher number of quality reviews, which can boost a property’s review score on TripAdvisor. With the interface, hotel guests automatically receive a customised email after checking out, encouraging them to send feedback to the hotel as well as posting a review directly to TripAdvisor. The hotel will also receive valuable feedback to help them make the necessary operational improvements and provide the best possible guest experience. With the average response rate from GuestRevu emails being 24%, the interface is already delivering impressive results amongst Guestline customers. The Coaching Inn Group saw a 300% increase in the number of reviews collected in just 3 months of using the GuestRevu solution. Kevin Charity, CEO Coaching Inn Group. Guestline's joint effort with GuestRevu gives the business mechanized visitor input and online notoriety administration, straightforwardly associated with the PMS. Ninety-three for every penny of voyagers say online surveys affect their booking choices, which makes this an especially appealing suggestion for lodgings, overhauled lofts, bars and inns hoping to additionally enhance their visitor pre-and post-stay involvement. Awesome post. I am really happy to see this post. To get help on essay writing you can visit best paper writing service . You will get all kinds of paper from this service.